Riding on the JR Chuo-Sobu Line into Akibahara Station gives you the image you need to understand how people in Tokyo utilize the trains and public transportation in general. The metropolis' complicated mess of overland trains and subways enables the city to thrive, moving people directly to the place they want to be in a punctual and efficient fashion. The Shinkansen (bullet train) is Japan's flagship technology; involving glorious engineering and design, fantastic use of technology, unmatched convenience, phenomenal efficiency and fantastic service. Starting service in 1964, the train linked Japan's two largest cities, Tokyo and Osaka. In certain parts of the city you can see the train snaking along, not yet with enough space between stations to reach top speeds. Many of Japan's top destinations can be reaching from a single Shinkansen line in less time than it would take to go through security and wait to board an airplane at an airport. You just show up, buy a ticket and get on the next train. Unlike most airports, they take you directly to city centers. They are spacious, relatively comfortable, ride smooth and people onboard are respectful and quiet. Shinkansen technology has even been exported to England, China and Taiwan. 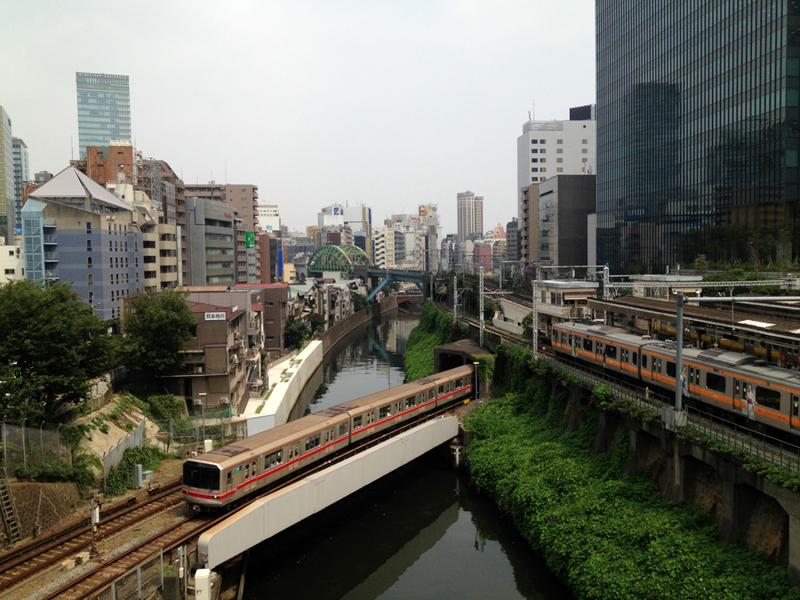 Tokyo is the climax of Japan's transport prowess. In some ways it may even be too complicated and expansive. The subway system has 13 lines, 260 stations, is run by two different companies and is the most used subway system in the world. Take a look at the subway here map to get an idea of its complication. Now on top of this is the network of overland trains, of which there are well over 100 different train lines from more than 10 different operators in the greater Tokyo area. That's unfathomable. This map barely even helps make it mildly fathomable. As can be seen in the above photo of Ochanomizu Station, train lines and subways criss-cross, duck and weave each other at all times. Stations with transfers between multiple lines are incredibly complicated and very easy to get lost in. Cars, like many things in Japan, can be incredibly compact. Streets help dictate that size and can get quite narrow and crowded. More importantly, you need a place to store this car and given how expensive land can be, the smaller the better. This is a place where the new Mini Cooper, at one time the smallest car on the market in the United States, looks huge in comparison to other cars on the road. Seen above is a cute little Japan Post van. Most mail delivery is actually done via scooters just like the delivery one above. If there is one thing as ubiquitous as trains in Japan, it's bikes and in many cases they go hand in hand. Outside almost any train station across the entire country will be a parking lot over flowing with bikes, like the one seen above near Shibuya Station. Check out this automated underground bicycle garage. The streets of Tokyo are not quite a highway of bikes like Copenhagen, but they are the preferred way to get around your own neighborhood and do a little shopping. While I was walking around the back streets of Harajuku, I passed Design Festa. A free art gallery I've been to a few times that features a constantly changing variety of artists. Except that this time their back garage wasn't featuring art, instead it was a presentation of middle-aged and older Japanese people that have spent much of their lives motorcycling around the world. I got to speak with a few of them and they were all incredibly nice and warm people, excited to talk about all the places they went and their observations on different cultures. 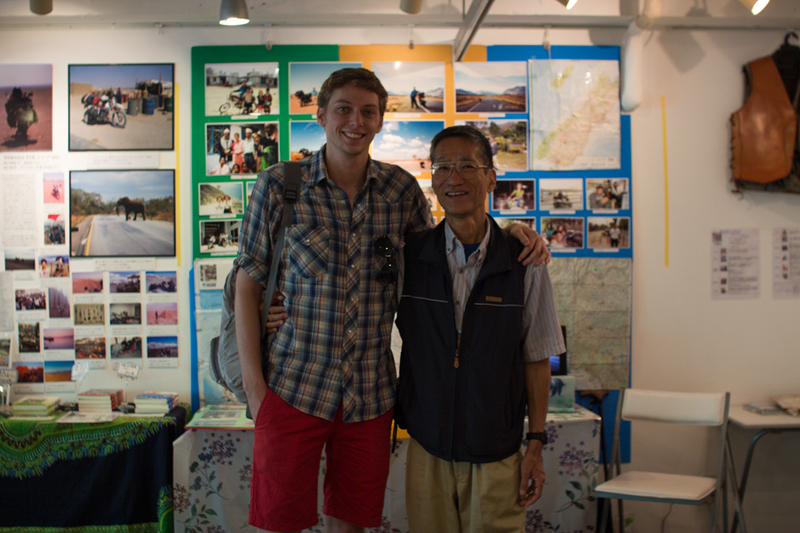 Shingo Tsuboi lived on the road from 1985 to 1996 reaching virtually every crevice of the map. During which floated down the Amazon on a raft he built himself, the story of which was adapted into a comic book. Here's an amazing photo from his travels. And another. Toru Nakazawa, pictured with me above, has motorcycled around the permiter of Australia as well as plenty of New Zealand, Nepal and Thailand. Everyone else was quick to point out to me that he has a handicap, he's missing both legs and uses prosthesis, but he considers it a non-issue. Check out the group's website here (Japanese). Taxis in Japan are fantastic, comfy, clean, they have fancy automatic doors and the drivers wear cute white gloves. But I hate riding in them because they are fantastically expensive. In Tokyo, a city who's public transportation basically shuts down after midnight (it is not the 24-hour city the world likes to think that it is), getting that last train is a mad dash simply to avoid having to fork over the initial ¥700+($7/€5) plus distance. A 15 minute taxi ride can possibly cost more than ¥3,000 ($30/€23). To compare, a similar ride in New York can be less than $10. Tokyo can change the way many people look at what transportation can be. It maybe beyond comprehension to anyone except locals, I have too many stories about how the subway and stations have gotten the better of me, but that's exactly what Tokyo is and cannot be any other way.